Seth turned 8 recently, and to celebrate, aside from his laser tag party, we stayed in the city for three nights with our good friend Alli, and painted the town red (Seth's favorite color, ala fire trucks). We bunked again at the comfy, artsy Roger Smith Hotel on 48th and Lexiington, and gallavanted around all over town, as we did back in December, this time thankfully without the slush and mess from the winter blizzard. Day 1 included: A visit to Grand Central Market (picked up some amazing cheese at Murray's), Jam Paper (very cool paper products and more), Spy Shop (Seth got an invisible ink device), a Cartoon Store, Sky Ride (details below...enjoyed it) and dinner at the delicious Rosa Mexicano, after trying to get into a dinner spot at Eataly and didn't succeed (too long a wait). Seth loved that the restaurant was across the street from a firehouse that had it's doors open, so we schmoozed with the firemen and took photos. Day 2 - Visit to Build-A-Bear Workshop(details below), saw the off-Bway musical (and enjoyed) Freckleface Strawberry (I blogged about the show last week. Discount offer below. ), visited yet another spy store, super cool Japanese bookstore/gift shop, the Drama Bookshop (love it there), a major trip to Toys R Us (where Seth picked out bday gifts for himself), culminating in dinner at the Brooklyn Diner (love the thick pea soup strewn with hot dogs chunks). Day 3 - Walked around Union Square, including visits to the "awesome" Forbidden Planet, Game Stop and the excellent toy store Kidding Around. Then subwayed it downtown to the Lower East Side. Brought back memories of years gone by when I used to eat at Ratner's with my folks (my beloved mom loved the vegetable cutlet with mushroom barley) and I used to shop there on a Sunday with my longtime friend Debbie, and we always came home packed with shopping bags full of great stuff. Things have changed quite a bit since those times, and what you see mostly now are small hip clothing shops and funky art galleries. Quite a transformation. We also popped into Economy Candy, a fun retro candy store packed to the rafters with almost anything confectionary and caloric you can imagine. You truly feel like a "kid in a candy store" there! After all this, headed back uptown for the 7pm ride on THE RIDE (details below), where friends joined us, and we had a total blast. This was our second time on THE RIDE, and this time, it was all the more special since the hip hop performance street artist gave Seth a shoutout for his birthday. If you have yet to experience THE RIDE, check it out! Afterwards, back at Brooklyn Diner in Times Square for Seth's birthday dinner featuring the most massive piece of chocolate cake that everyone enjoyed! It was a day to remember. Day 4 - Sony Wonder Technology Lab (free...interesting), Lee's Art Shop (great kids floor), TJ Maxx (57th and 8th...didn't know they opened a branch here)......returned home with loads of memories and goodies....and plenty to talk about. NYC is truly one of the greatest cities in the world, and it's so easy to take it for granted if you live here, but there's much to enjoy if you take the time to explore and scope it out! I highly recommend you take in the following in your next visit to NYC. Here's the inside scoop about four of the top attractions we enjoyed. New York's only virtual tour simulator. This is a treat! • Fly across only the skyline. • See the real New York. • Fun for children or adults. • Nearly 8 million happy vistors since 1995. Actor Kevin Bacon narrates your 30-minute adventure, taking you across the skyline on a unique journey around nearly three dozen famous landmarks. You never have to leave the comfort of the second floor at the famed Empire State Building. • “Top 10 Things to Do in New York" - a primer on all things Big Apple! 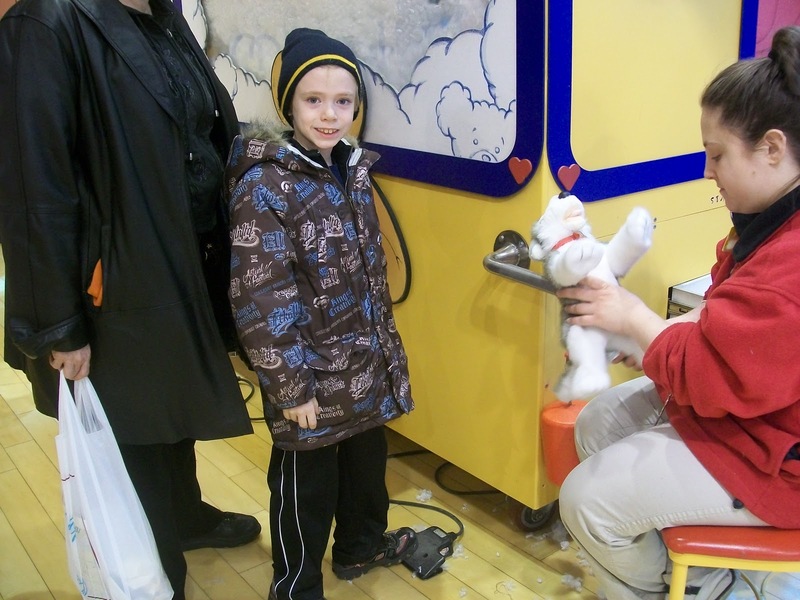 Build-A-Bear Workshop, Inc. is the leading and only global company that offers an interactive make-your-own stuffed animal retail-entertainment experience. Founded in 1997, the company currently operates more than 400 Build-A-Bear Workshop® stores worldwide, including company owned stores in the United States, Puerto Rico, Canada, the United Kingdom, Ireland and France, and franchise stores in Europe, Asia, Australia, Africa, and the Middle East. In 2007, the interactive experience was enhanced - all the way to CyBEAR® space - with the launch of buildabearville.com®, the company’s virtual world. We had a great time. Seth made a husky dog he named Patches, and fell immediately in love. There is something for everyone here. And, the cutest, cleverest accessories and clothing for the wide array of stuffed animals you can make and see come to life. NOTE: BULD-A-BEAR WORKSHOP IS GIVING AWAY A $25 GIFT CARD. TO ENTER, POST A COMMENT ON THIS BLOG, AND THE WINNER WILL BE CHOSEN AT RANDOM AND NOTIFIED BY THE END OF MARCH. BE SURE TO INCLUDE YOUR EMAIL ADDRESS AND INDICATE THAT YOU'RE INTERESTED IN BUILD-A-BEAR WORKSHOP. THE RIDE, is loads of interactive fun and a unique experience....chockful of jokes, singing, doing the wave, sightseeing and more. THE RIDE’s specially-designed custom vehicles are the tallest allowed by federal law on city streets. The bus is fitted with stadium-style seating that orients riders sidways to look through massive windows, and two on-board hosts banter comedically as they travel through the streets of midtown Manhattan, commenting on New York’s history and its iconic sites and structures, and giving insider secrets about the city – all while incorporating actors and performers along the route who interact with the vehicle and its passengers. External speakers and exterior lighting allow the on-board hosts to make everyone on the street part of the experience. Surprises show up all along the route, featuring sites from the Chrysler Building and Grand Central Terminal to Times Square and Columbus Circle. A full schedule for THE RIDE is available at experiencetheride.com. Tickets are on sale now, available three ways: online at experiencetheride.com; by phone at (866) 299-9682; and in person at THE RIDE Box office located at the New York Marriott Marquis Hotel, 1535 Broadway between 45th and 46th Streets. To save $5/ticket, use the code GOMAMA when ordering. Join them on Facebook to get the latest news. http://www.facebook.com/ExperienceTheRide. 3 EASY WAYS TO BUY TICKETS! NOTE: MOTHERHOODLATER.COM IS GIVING AWAY A FAMILY FOUR PACK TO SEE THE SHOW. TO ENTER, POST A COMMENT TO THIS BLOG AND INDICATE YOU ARE INTERESTED IN THE SHOW. BE SURE TO PROVIDE YOUR EMAIL ADDRESS, AND THE WINNER WILL BE CHOSEN AT RANDOM AND NOTIFIED BY THE END OF MARCH. *RESTRICTIONS: Limit 8 tickets per order. Valid through April 17. Additional blackout dates may apply. Not valid on prior purchases and cannot be combined with any other discounts or promotions. All sales are final—no refunds or exchanges. Offer subject to availability and includes a $1.50 facilities fee. Offer may be modified or revoked at any time without notice. Standard Telecharge service fees apply to phone and online orders. 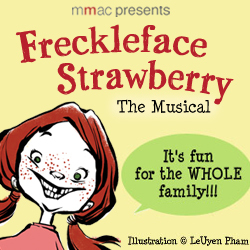 Note: Thanks to THE RIDE, SKYRIDE, BUILD-A-BEAR WORKSHOP and FRECKLEFACE STRAWBERRY for providing promotional visits. Brandon made a Husky bear at Build-a-Bear also (see photos from my Canada blog!). Brandon's bear is named Wolfie, though. Enter me to win: Cara@CaraMeyers.com! I would definitely do The Ride again!! It was awesome for both adults as well as kids! SkyRide looks great! We'll have to check it out!! What an original idea staying in the City and enjoying it! We live so close that we take for granted that we can go in whenever we want, but never do. What a fabulous week for Seth! And what a week to remember!! Thanks Cara. We had a blast, and it was so great you and Brandon joined us on THE RIDE and for Seth's bday celebration at Brooklyn Diner. It was special and fun to share it with you. I would do THE RIDE again too! !